Facebook frequently uses surveys to gauge user opinion about features, changes and ideas. One recent such survey raised more than a few eyebrows as the social network asked whether it was OK for a man to ask a child for sexual pictures. That any company should, essentially, ask whether pedophilia is acceptable is more than a little strange, but for such a question to come from such a big name as Facebook almost defies belief. The survey appeared over the weekend, surprising those who saw the questions. Two worrying questions appeared in the survey, the first of which asked: "There are a wide range of topics and behaviors that appear on Facebook. In thinking about an ideal world where you could set Facebook's policies, how would you handle the following: a private message in which an adult man asks a 14-year-old girl for sexual pictures." When thinking about the rules to deciding whether a private message in which an adult man asks a 14 year old girl for sexual pictures should or should not be allowed on Facebook, ideally who do you think should be deciding the rules? Guy Rosen from Facebook admits that the survey question was a mistake, and addressed concerns that some had expressed about Facebook not simply contacting the police in such a situation: "We run surveys to understand how the community thinks about how we set policies. But this kind of activity is and will always be completely unacceptable on Facebook. We regularly work with authorities if identified. It shouldn't have been part of this survey." 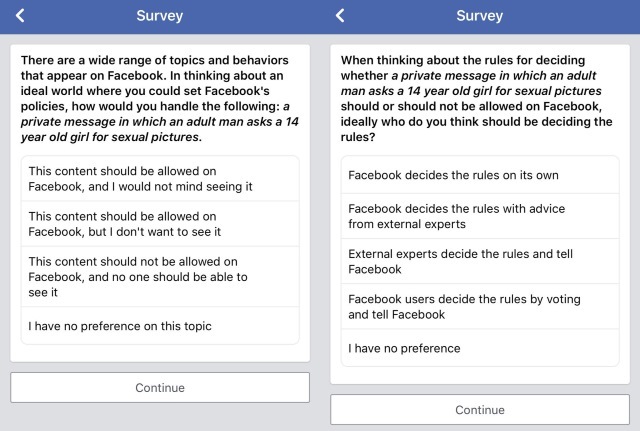 We understand this survey refers to offensive content that is already prohibited on Facebook and that we have no intention of allowing so have stopped the survey. We have prohibited child grooming on Facebook since our earliest days; we have no intention of changing this and we regularly work with the police to ensure that anyone found acting in such a way is brought to justice.